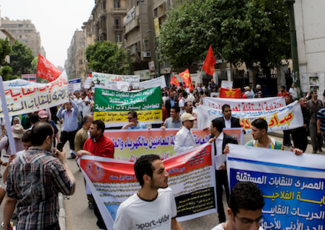 Where Were the Egyptian Workers in the June 2013 People’s Coup Revolution? Αναδημοσίευση από jadaliyya, η έμφαση σε ορισμένα σημεία δική μας. Ενδιαφέρον άρθρο για την πρόσφατη ιστορία του συνδικαλισμού στην Αίγυπτο, και το ρόλο των ανεξάρτητων συνδικάτων που φαίνεται στην παράγραφο που παραθέσαμε πιο πάνω. “We started the 2011 revolution and the rest of Egypt followed,” is a statement Egyptian workers make with great conviction when discussing the movement for change in their country. Accordingly, in order to continue what began in January 2011, the masses of workers were out yet again in the streets and squares of Egypt before and on 30 June, and in the ensuing days until former president Mohamed Morsi’s removal from office on 3 July. This might seem surprising, given that there were no signs or banners on 30 June indicating workers’ participation. In fact, this was based on a prior agreement among the organizers of the protest, the youth-led Tamarod Campaign. Protesters were to hold up only the Egyptian flag, in addition to homemade signs, but not organizational insignia. So you did not see workers marching under the banner of their union or profession on 30 June. Yet the workers were out in droves in every city and town in Egypt protesting as an integral part of the June 2013 people’s coup revolution. In certain industrial towns such as al-Mahalla al-Kubra, the Tenth of Ramadan and Sadat cities – they were the majority, and leading the marches. This entry was posted in ΝΕΑ ΑΠΟ ΤΟ ΜΕΤΩΠΟ and tagged ΑΙΓΥΠΤΟΣ, ΑΝΑΔΙΑΡΘΡΩΣΗ, ΑΥΤΟΟΡΓΑΝΩΣΗ on July 24, 2013 by simeioseis.